Drag within the image to explore the Corracloona segment of the Black Pig’s Dyke in virtual reality. The Black Pig’s Dyke (Claí na Muice Duibhe) belongs to a class of ancient monuments known as a “linear earthwork,” so called due to its great length, with a construction of multiple banks and ditches.2 Discontinuous sections of the Black Pig’s Dyke, known by different names in different areas, have survived in Counties Leitrim, Fermanagh, Longford, Cavan, and Monaghan.3 In most sections the Dyke consists of a bank with 3 m (10 ft) ditches on both sides, the bank usually about 9 m (30 ft) wide and originally perhaps 6 m (20 ft) high. 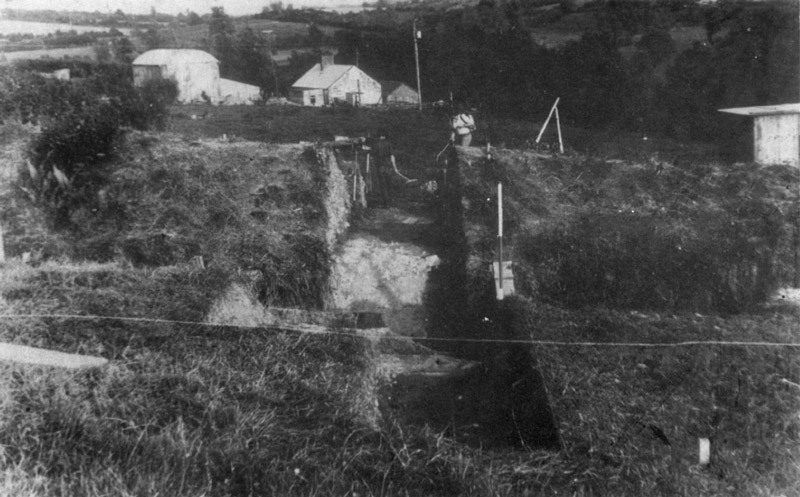 Excavation in 1982 (see below) of a stretch of the Dyke revealed evidence of a timber palisade, with charcoal found in its trench dated to 390-70 BCE; other sections of the Dyke are likely from the same period of the Irish Iron Age. Because some of its segments correspond roughly to the modern borderlines separating the Republic of Ireland from Northern Ireland, the Black Pig’s Dyke has supplied ancient superstition—and a modern dramatist—with a symbol of the bloodstained divisions of the two communities sharing the island. 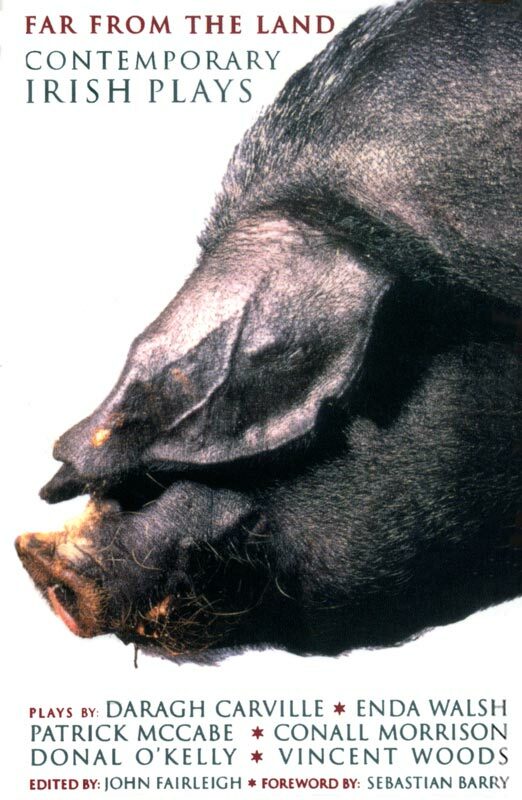 But the compelling story of a shape-shifting magician is the tale that gave the Black Pig’s Dyke its name. The narrative of the wicked schoolmaster and his dark magic has been recorded in all the locations of this linear earthwork. Echoes persist in the modern era: as noted in the video interview (below, right) parents might warn their children to return home early lest they come to harm by crossing the Black Pig’s Dyke.6 While there have been at least 50 different examples of this story collected by folklorists, a characteristic telling of the tale was recorded in the townland of Lattone, Kiltyclogher, Co. Leitrim, by R.S. Rogers in 1957 from 76-year-old farmer John Quinn, whose land was crossed by the Dyke. 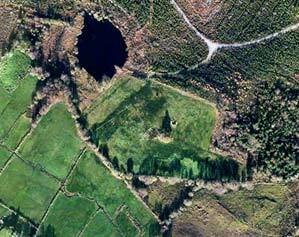 Our virtual-reality panorama (below, left) was photographed a short distance to the SE of this townland. 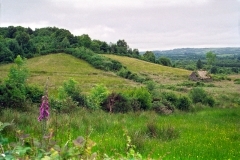 • Co. Leitrim, running NW-SE, from Lough Melvin to Lough MacNean, near Rossinver and Kiltyclogher. • Co. Fermanagh, in Lislea and Mullynavannogh townlands. 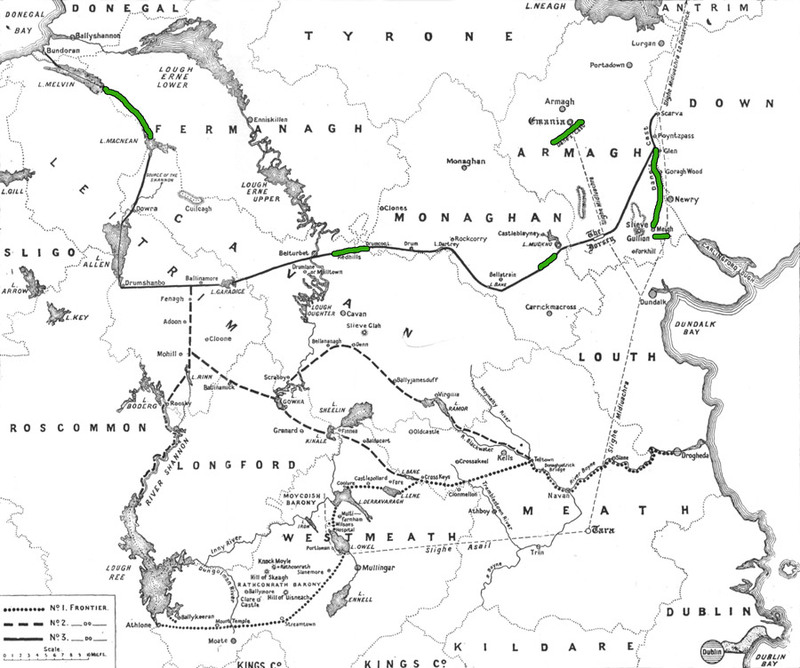 • Co. Longford, running NW-SE from Lough Gowna to Lough Kinale, near Dring and Granard. 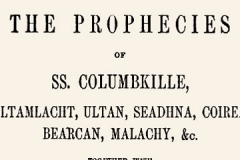 • Co. Cavan, E of Bellanagh, in the townland of Ardkill. 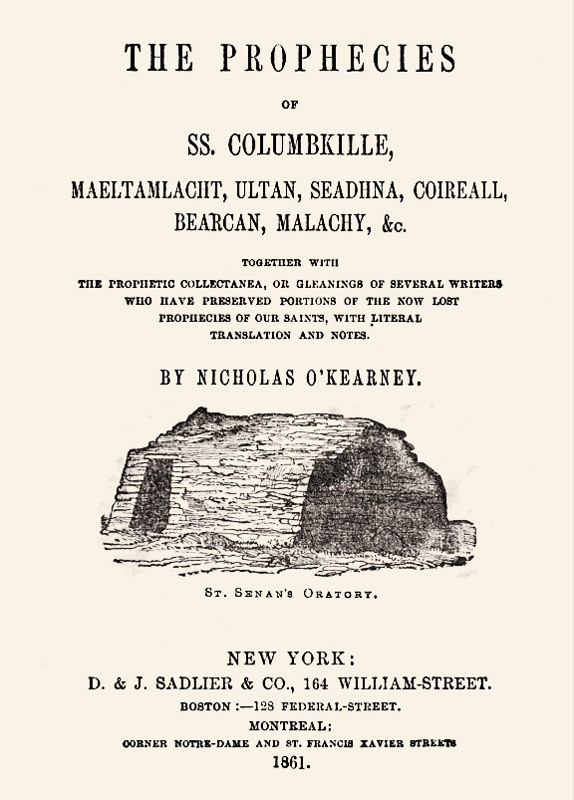 • Co. Monaghan, running W-E from the Finn River to the townland of Corrinshigo, near Drum. In 1908 and 1916 W. F. De Vismes Kane wrote of the Black Pig's Dyke as three stages of the frontier of the Kingdom of Ulster. 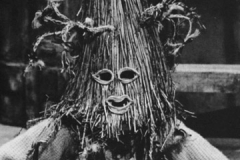 He filled gaps by making extensions of the routes from literature and folklore (Davies, 1955). Move your cursor into this map to see Kane’s third stage of the Dyke with green indicating those portions of his route confirmed by archeological evidence. Click to see the entire map. 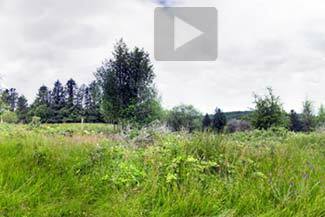 Click for a VR view of the Kiltyclogher segment of the Black Pig's Dyke from two positions. Near the same area south of Scotshouse, Co. Monaghan, where in 1820 the farmer obliterated the Worm Ditch, archaeologist Aidan Walsh in 1982 excavated within a well-preserved 130 m (142 yd) section of the Dyke. This was the first professional research undertaken on the monument anywhere along its extent. The Dyke here, with a total length of 9.5 km (6 miles), consists in the excavation area of a double bank and ditch, with a combined width of 24 m (79 ft). Walsh’s research uncovered evidence of a wooden palisade fence about a meter (3.3 ft) to the north of the earthwork banks of the Dyke. Evidence suggested that the palisade timbers were some 30 cm (1 ft) wide, perhaps consisting of trunks of oak trees. Charcoal found in the palisade trench allowed Walsh to date the structure to the first few centuries BCE. 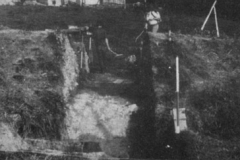 A photograph of the 32 m (105 ft) excavation trench may be seen in the gallery at the bottom of this page. In parts of Cos. Monaghan and Cavan, the monument has inspired tales of a quite different creature than a Black Pig. There the rampart goes by the name “The Worm Ditch,” with the story of an immense and horrific worm—perhaps a dragon or serpent—that writhed and wrecked it way through the land, tunneling through the earth and forcing it up into the long rampart we see today. Una Braden (right), shown here with Sr. Mary Oliver Braden, recounts the folklore of the Black Pig’s Dyke (1998). 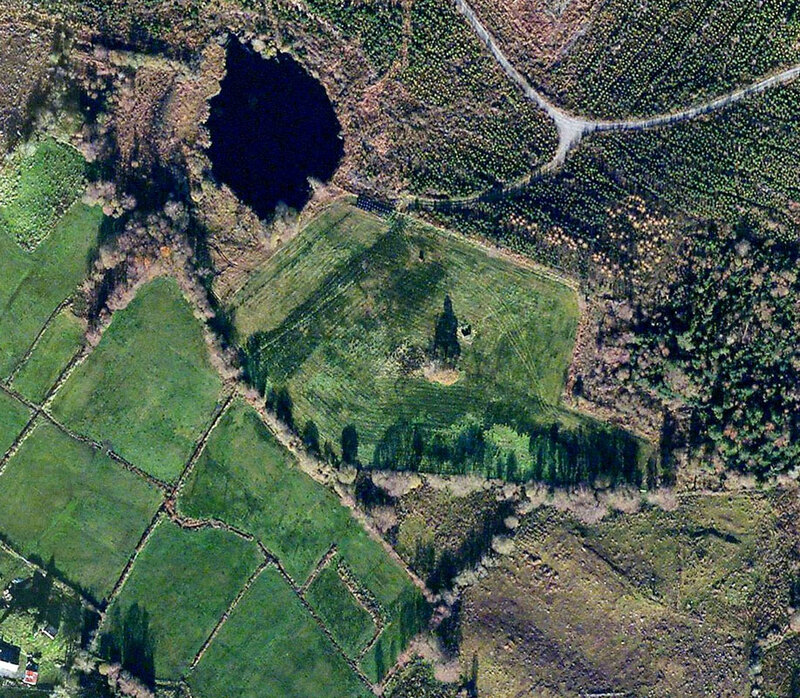 This is a satellite view of the Corracloona segment of the Black Pig’s Dyke. “It was a long time ago, Elizabeth, and it was not a long time ago. It was a time when to go east was to go west, when to go south was to go north, when people sang songs at a wake and cried when a child was born. 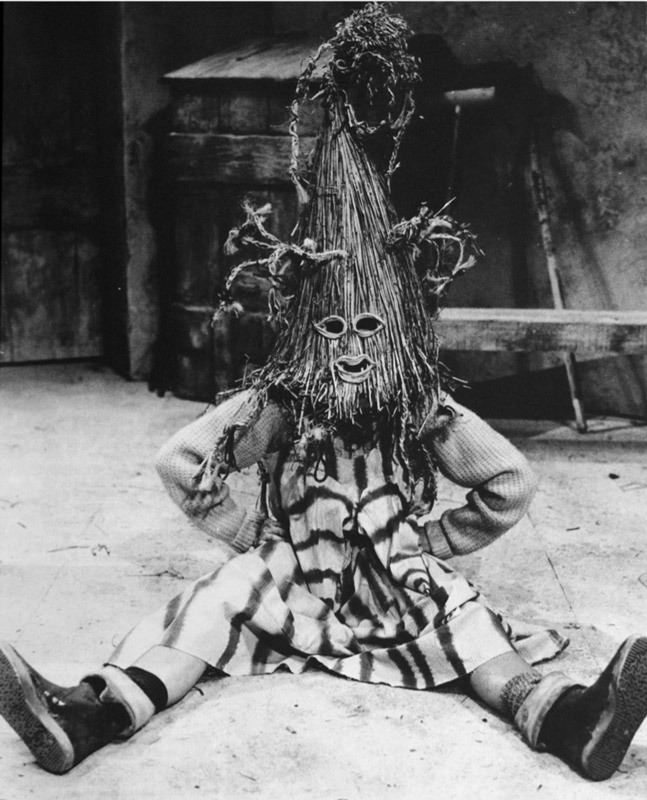 It was in a land where the sun never rose and the sun never set, where the dead prepared shrouds for the livin’ and straw people walked the roads. 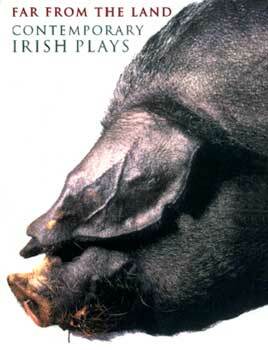 Vincent Wood’s play At the Black Pig’s Dyke was published as part of an anthology in 1998.